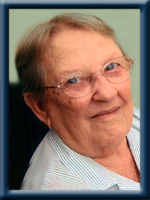 CONNOLLY – Annie M., 88, of Bridgewater, formerly of Middlewood and Liverpool, passed away peacefully in South Shore Regional Hospital, Bridgewater on Tuesday, May 14th, 2013. Born in West Dublin, Lunenburg County, she was a daughter of the late Foster and Susan (Smith) Corkum. Annie was a life-long member of Middlewood United Church and the oldest of her siblings. Surviving are her sons Garfield Slauenwhite (Beverley Smith) of Ninevah, Max (Margaret) Slauenwhite of Voglers Cove, Clarence (Laverne) Slauenwhite of Hebbs Cross, her daughters Phyllis (James) Harris of Dublin Shore, Pearl Slauenwhite (Eugene Feener) of Whynott Settlement. Her sisters Shirley (Douglas) Cleversey of West LaHave, Margaret (Douglas) Crouse of Hebbville, Minnie Hirtle of Mahone Nursing Home, Ruth Wile of Auburndale. A number of grandchildren, great grandchildren, great great grandchildren, nieces and nephews. She was predeceased by her first husband Kelly Slauenwhite, her second husband Carmen Connolly, a grandson Christopher Harris, an infant sister Barbara, a sister Muriel Minnick, an infant brother Lockie and brother Ralph and a half sister. I am sorry to hear of my grandmother’s passing. Since finding my birthmother Pearl I was happy to have met her. I did not know much about her but she seemed very nice to me. I do keep in contact with uncle Clarence and Valerie on the computer. My sincere sympathy and condolence to all the family. I never got to meet my Aunt Annie, but from what I know of her sisters and my mom she had to be a sweet and strong-hearted person. May you REST IN PEACE. Our deepest sympathy and condolences to all the family. We are very sorry for the loss of your mother. May good memories help you through the days and months to come. Sending hugs to you both. We send our sincere sympathy to all of the family at this very sad time. Keep your wonderful memories of your mom close to your heart always. To Annies family,So sorry to hear of annies passing,got to know her trought Homesupport,always enjoyed our visits.May you rest in peace sweet lady.